Microsoft Nigeria brought together some of Nigeria’s bloggers to a special Bloggers Meet Up session at their office in Lagos. Microsoft Nigeria got together some bloggers from Nigeria to their Victoria Island, Lagos head office. This was a an opportunity for the bloggers to meet the Microsoft team and learn about some Microsoft Technologies. The social media enthusiasts invited were taken through Windows 10, Windows 10 upgrade from older Microsoft Windows generations. Windows 10 features such as personal assistant; Cortana, security in Windows 10, a more familiar user interface, Office 365 and the cloud. 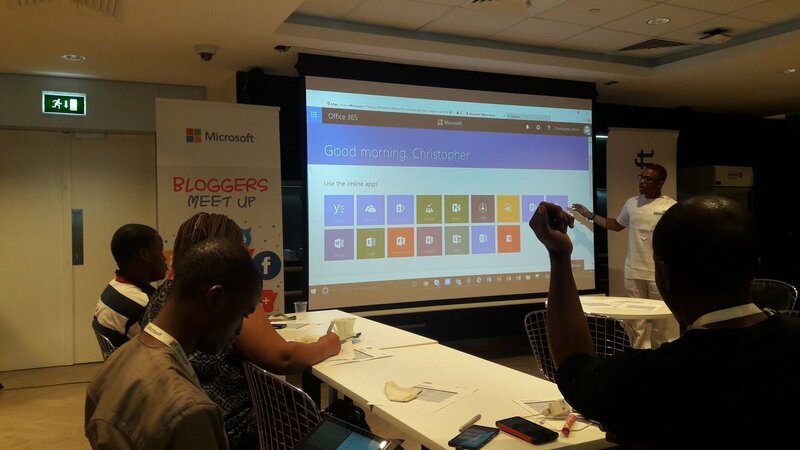 There was also introduction to some of the new features coming in the Windows 10 Anniversary Update at the bloggers meet up. How SME’s and NGO’s can take advantage of special Microsoft packages. Microsoft Nigeria Communication Lead, Yemi Orimolade was around to welcome the guest and get things rolling. Windows10 is designed for Digital Revolution. It’s designed to make you more productive. Windows 10 update is a full update and not a trial or introductory version. Sway is a pictures and text product of Office 365 used to tell stories and can be shared. You can still Upgrade to Windows 10 for free till July 29th from a genuine windows 7, 8, 8.1 PC. With Skype for Business you can text, call and video chat(group chat) all in one app. More details on Sway for office; It‬ has Editing tools that helps you cut, crop, resize, skew and do a lot of mini Photoshop. If your business is less than 5 years old, privately held, and earns less than $1M annually and you need some startup help. The Microsoft BizSpark program is there to help you grow. What do you think about the knowledge shared at the Microsoft Bloggers Meet Up? A good thing? Did you know all of this? Do you know more let’s learn together, share in the comments.